Challenge: Bring beauty and tranquility to a new corporate office space through wall-mounted photographic art. 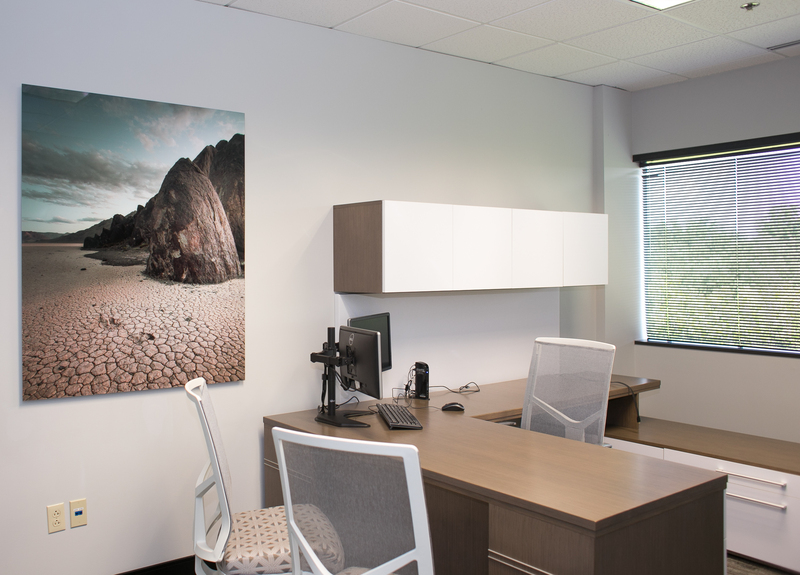 With the construction of a new corporate office underway, MTM, one of the most experienced and qualified non-emergency medical transportation (NEMT) brokers in the U.S., envisioned office walls abundant with beautiful photography of tranquil nature-based settings. To make MTM’s dream a reality, they hired a talented photographer, Alfredo Diez, and contacted the experts at Artmill.com to ensure only the best-of-the-best for the printing and mounting of the new office artwork. Founded on years of experience in gallery art mounting, Artmill.com is a professional quality art printing/mounting company known for its craftsmanship guarantee that promises only the best products and materials for printing and mounting processes. For years, Artmill.com has relied on Mactac® for its adhesive mounting needs. So, when the MTM job came in, it was a no-brainer. Artmill.com printed the photographic images with a water-based Epson® inkjet printer and used Mactac’s PERMACOLOR® PermaTrans® PUV2100 mounting film to face-mount the images to a Tru Vue acrylic surface, then back-mount to Dibond aluminum composite sheeting. PermaTrans® PUV2100 is an optically clear, two-side coated film designed for face- and back-mounting transparencies to glass, acrylic, polycarbonate, Plexiglas® and other clear or transparent substrates. A clear polyester release liner protects each side, permits complete visual inspection of the product, easy liner removal and a distortion-free adhesive surface. PUV2100 can be used wherever superior clarity and smoothness are required, even over UV inkjet prints. Did you use Mactac material on a recent project? Contact mactac.americas@mactac.com to have your story featured! For more information regarding Mactac products or graphic solutions, call 866-622-8223, or visit www.mactac.com/graphics.